ABSTRACT. Siloë is a game. An audio-visual installation artwork in which participants are actively involved in a process of creation and renewal of sounds and lights, becoming themselves part of the artwork. Players interact with their own mobile devices or their bodies to control the sounds originating from twelve speakers located on the vertices of a dodecagon. A beamer on the top spot of the installation projects visuals that are modulated by the audio. GENESIS. This installation is the result of two years of research and metaphysic speculations. In order to allow ourselves to sense an experience of natural perception, and to let it truly happen, we have to turn ourselves back into Nature. Siloë helps us in this mission by fostering the perception of time based on the instant, rather than on the duration, and through the refusal of the common concepts of time and original culture. The most common method to measure time is based on the solar system, and the number 12 is its most recurring expression. Twelve sub-divisions of shape, feature and quality. Inspired by the concept of “friction“, intended as sacrifice, Siloë reproduces these aspects in their most intimate essence, in their acoustic nature. Twelve acoustic entities, which synthesis is based on the Schumann‘s resonances, constitute the model of the “supreme order of things”. Twelve independent voices that can reach their absolute unity. The loop, typical representation of the eternal return, expresses the continuous regeneration of an instant and at the same time annihilates the concept of time as duration. RATIONALE. In our recent studies of soundwave, we showed a relationship between the exposure to specific sound waves and the stimulation of particular hormones [such as cortisol] in humans. This pilot study, involving about 50 testers, gave several interesting clues, to be confirmed in a larger study: the high frequencies raise cortisol level, while low frequencies diminish it; this change is not correlated to the emotional response related to the exposure; age, gender and habit seem to influence the individual response. INSTALLATION. From the results of the said study an installation was conceived. The purpose of this work is to supply a device that may be employed for: therapeutic sessions, audio-visual compositions, interactive improvisations, didactic activities and social entertainment. The universal language of geometry was chosen to abstract from any cultural roots. The acoustic nature was based on the Schumannʼs resonances and the use of twelve entities. INTERACTION. Participants will use their mobile devices and their bodies to control the synthesized audio and videos. There are twelve audio sources, corresponding to twelve tones, one for each active participant. Through the web interface, she can control its timbre by selecting a variation or tweaking the filters. The overall produced audio is broadcasted via a webradio. The position of human bodies inside the circle affects the size, the color and the shape of the figures projected on the floor representing the relationship between the twelve tones and their modulations. SPACE. The installation could be hosted inside a geodesic dome. The choice of this structure was made in base of its relation with the dodecahedron and its number twelve. 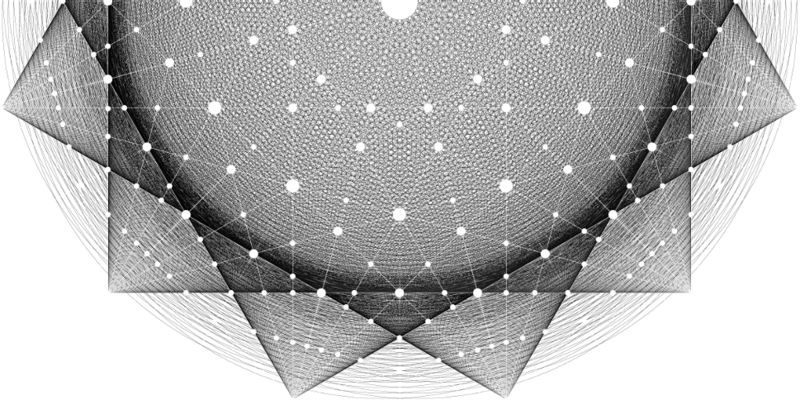 Also Poincaré proposed a dodecahedral space model of the universe. However, instead of the dome, will be enough a space measuring not less than 6×6 meters and not less than 5 meters of height. SUPPORT. If you like this project and want to see it realized, write here. We are not asking for charity, but the collaboration of motivated people to help us realize this idea.. From people to people, with love.